Brighton & Hove Albion winger Anthony Knockaert says depression made it "mentally impossible" for him to perform well for the Premier League club last season. The 26-year-old Frenchman received counselling for his issues and says he is now a "happy man again". Knockaert was influential throughout Brighton's promotion campaign of 2016-17 despite dealing with the death of his father in November 2016, which he described as the "toughest moment" of his life. However, he made less of an impact during Albion's debut Premier League campaign, scoring three times in 33 league outings. 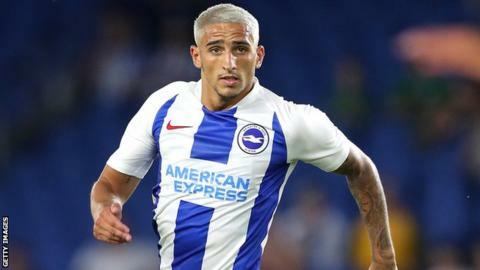 "I went through a divorce last year during pre-season and it was tough to take, especially after my dad [passing away]," Knockaert told BBC Sussex. "When I lost my dad the most important thing for me was my wife and baby. I realised I wouldn't be with my little boy every day. "I was going through a really bad period and it was really tough. It was mentally impossible for me to go and perform. Knockaert, who has been an ever-present for the Seagulls in the top flight this season, has encouraged anyone else dealing with depression or mental health issues to seek help. "I take everything as an experience and will use this to be stronger and be better on the pitch," he said. "When you are going through periods like this it is always good to see someone and not be scared to talk to someone, because one day you will be yourself again. "I was seeing a counsellor last year for a good few months. She and the club helped me a lot. "Now I am really good again and back to myself."